Every May an intense and somewhat curious ritual goes on in Alba in the Piedmont region of Italy. There, dozens of international journalists gather to taste hundreds of excellent wines made with the nebbiolo grape. These are the Barolo and Barolo Riserva DOCG wines, and the Barbaresco and Barbaresco Riserva DOCG wines. They are beautifully crafted red wines, aged in wood and in bottle for years before they are ready to be released on the market. That is the point at which we (the media) are invited to the formal May tasting, dubbed Nebbiolo Prima. 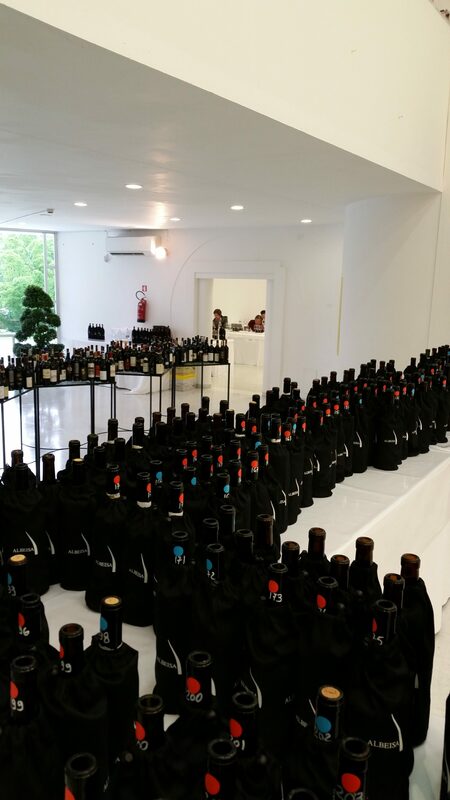 Each day for a week, we taste between 50 and 100 wines – before lunch. 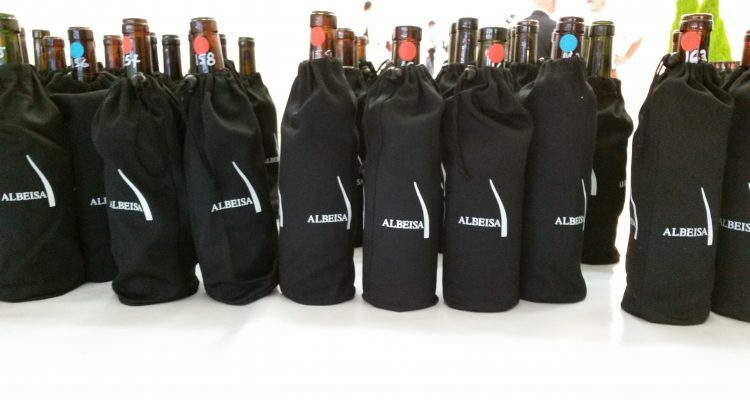 All the wines are tasted blind: we know the geographic category but not the producer. In order for us to sip (and spit!) all this sampling, trained Italian sommeliers are employed as wine servers. They pour the wines for each taster at his or her own pace, and they are really kept running. For those of us who don’t regularly sample these wines, the experience is rigorous to the point of being overwhelming. It’s also a bit crazy when you stop and think about it. Barolo and Barbaresco producers have put two, three, four, or five years of their lives into each of their wines; we are given mere seconds to taste and evaluate each one. Barolo DOCG wines are required to be aged for 38 months, including at least 18 months in wood. Barolo Riserva DOCG wines must also spend at least 18 months in wood, but they cannot be released without a minimum of 62 months of aging – a total of over five years in barrel and bottle. A significant number of the producers hold their wines back even longer. Further aging allows the tannins to soften and integrate, so the wines are even finer when they arrive on the market. And though the wines may be wonderful to drink on release, they can easily be held for at least another five or ten years – and most of these wines will still be great for several more decades. The current vintages are showing lovely mature fruit right now, along with herbs and spices and some floral notes. They have good acidity and a wide spectrum of tannins. 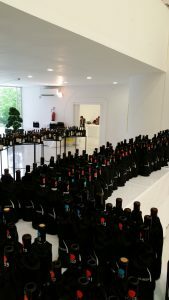 I had arrived in Piedmont with alarmingly little experience in speed-dating — I mean speed-tasting — these wines. I knew that both Barolo and Barbaresco are made with nebbiolo. This grape, which is full of tannins itself, nevertheless produces a wine that is lighter in color and body than many people expect. The lighter Barbaresco, and the medium-light Barolo, pair well with the subtle flavors of the local mountain cuisine including white meats, white sauces, delicate beef dishes, gnocchi and agnolotti. Barbaresco wines have a delightful, light fruitiness and floral elements, with a defined structure and a smooth, integrated finish. Barolo wines are a bit more serious, with more structure and tannin, more fruit and balanced acidity. They tend to age much longer, preserving their aromas of strawberry, violet and roses, anise and even tarry cooked fruit, for many years. 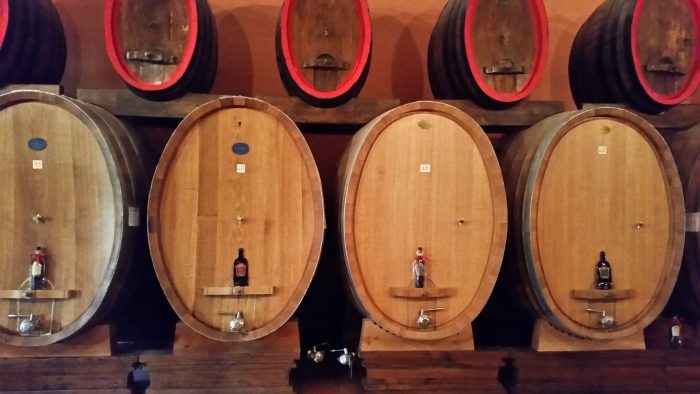 Traditionally, nebbiolo wines were aged in large casks made with wood that did not exert a huge influence on the finished wines. However, for a part of the late 20th century and the beginning of the 21st century, it was thought the tannins in the nebbiolo grapes could be tamed by putting them in small, new French oak barrels. But the opposite happened: oak tannins seemed to overwhelm the nebbiolo and add to the required ageing time for “softening” the grape tannins. The current thinking at leading Barolo producers (such as Ettore Germano from the Cerretta area of Serralunga) is that the riper the grapes, the less tannin they contribute to the wine. This is more important than ever today because of climate change: it is now possible to get very ripe grapes in most years. As recently as the second half of the 20th century, the nebbiolo grapes here in Piedmont were able to ripen well only a few times per decade. I found a tasting of selected 2006 Barolos very revealing. With the new knowledge of vineyard management, vinification, barrels, ageing and a new understanding of their nebbiolo grape, it was obvious that since then, many producers made changes in their winemaking techniques. Tasting the more recent wines, I found improvements in relation to tannin management, and more consistency in body and finesse. Additional changes were required by new Italian wine rules, having to do with vineyards and labeling. Barolo and Barbaresco were the first Italian wine regions to introduce official, specifically bounded single-vineyards in their territories and on their labels — Barbaresco in 2007 and Barolo in 2010. It took about 40 years of discussion, related Pietro Ratti, who just stepped down as head of the Consorzio di Tutela Barolo Barbaresco Alba Langhe e Dogliani. The final complication was not being allowed to use the Piemontese traditional term “cru” for a single vineyard, basically because it is a French word. When that uproar subsided, a new name was created: Menzioni Geografiche Aggiuntive, which is commonly abbreviated to Menzioni. Now that the producers have had a number of years to assimilate this, everyone seems to have calmed down and gotten on with their lives in regard to wine labeling. 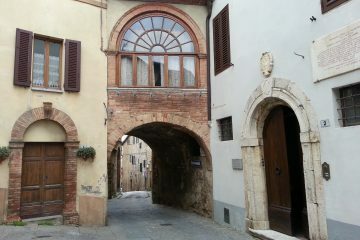 But, there’s still a certain amount of confusion in this region, such as in Barbaresco wine styles, for example. High quality Barbaresco wines are produced in delimited areas which are located near the Barolo zones. Because the soil is different here (among other factors), Barbaresco wines are lighter and fruitier. They also are ready to release within two years of harvest. 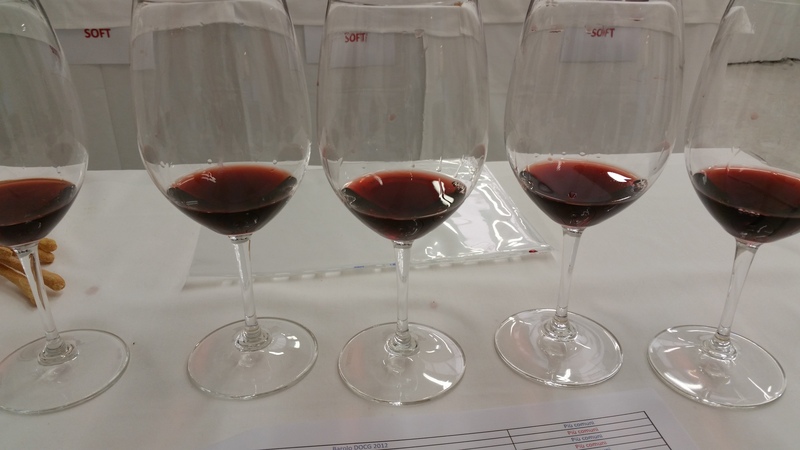 As an example, the tannins in the 2013 Barbaresco DOCG wines were generally milder, fruitier and more integrated. On the palate, the wines had sweet, bright red fruit. But some producers are trying to make their Barbarescos in a heartier style, perhaps to appeal to an international market of red-wine-lovers – many of whom don’t understand the concept of “light red wine.” In these robust Barbarescos, tannin from grapes as well as from barrel-aging can all-too-easily become overwhelming. I even found some of the same problem in the 2013 Roero DOCG and the 2012 Roero Riserva DOCG wines. Here, too many of the wines I sampled had incredibly mouth-drying tannins: not desirable in a wine that should be delightfully easy to drink at this point in time. Though all Barolo wines come from regions surrounding the city of Alba, there are critical differences in their sub-zones. Vineyards may vary in their orientation to the sun, and they contain differing amounts of clay, sand and limestone, dating from the time these hills were under the sea, millions of years ago. During our week of tastings, the wines were grouped by sub-region. The 2012 Barolo DOCG vintage wines were beautiful in most parts of the region, as shown by the wines of a good many of the producers in Barolo, Canale, Monta, Montelupo d’Alba and Verduno. This made it somewhat easier to speed-taste and form my own opinions of the new releases. Though it’s a huge oversimplification, for example in Novello I found pleasant but strongly fruity, drinkable wines with cherry notes in their aromas. 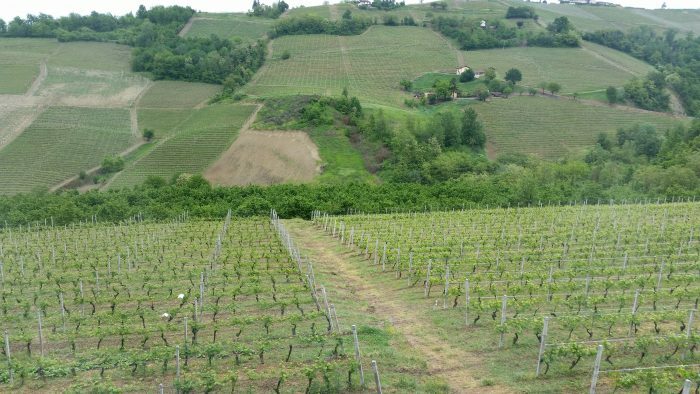 Serralunga d’Alba is known for its powerful wines; some producers had tamed their tannins and some had accented them in the wines. A large proportion of the 2012 Barolos of Castiglione Falletto (along with some from La Morra and Monforte d’Alba) showed a very nice balance of acidity and fruit, with cherry and cocoa and some sweet herb notes. The tannins were well integrated in many of the wines. However, especially in La Morra and Monforte d’Alba, there were a noticeable number of wines with mouth-drying tannins in the finish – which I hope will be reconciled in the next few years. All in all, Nebbiolo Prima is an amazing, immersive (possibly too immersive?) experience in wine tasting, with these light and elegant red wines.